Thursday night is expected to be a rather cloudy night with some patchy rain and drizzle pushing down from the north, most of the rain will be light in nature. Light winds. Minimum Temperature: 13 to 16C (55 to 61F). It is expected to stay rather cloudy through Friday morning with some further patchy light rain or drizzle. It is then likely to turn mainly dry and fine with long spells of sunshine developing. Maximum Temperature: 14 to 18C (57 to 64F). Removing the red dog waste bins from around Guernsey "will not increase the amount of dog waste". A spokesman said they currently have separate bins, which were put in to encourage people to pick up after their dogs but the waste was treated alongside the normal rubbish bins. He said dog owners are able to put their waste in the normal bins and they will still be collected. Jersey Chief Minister Senator John Le Fondre and Children's Minister Senator Sam Mezec were the first to sign a new pledge "putting children first". The pledge was announced after an Ofsted report for the Jersey Children's Commission found vulnerable children were not a priority for the government. The pledge commits the government and officials to doing more to protect children in their care and those in need in the island. A tribunal has found a Jersey delivery driver was unfairly dismissed from his job for taking time off to look after his sick dog. The Jersey Employment Tribunal heard Jonathan Blood was told by his vet that his dog needed eye drops every two hours. He contacted his employer by text to let them know each time that he would not be working his shift. His employers dismissed him via text message saying they had complaints from customers about late deliveries and that his absence reflected badly on the company. The tribunal ruled because there was no warning or disciplinary process it was an unfair dismissal and he should be compensated. 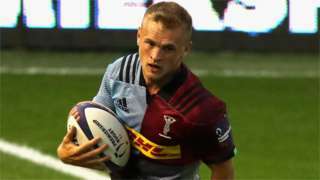 Championship side Jersey Reds sign Harlequins scrum-half Calum Waters on a season-long loan from the Premiership club. Changes to the way household waste is collected in Guernsey "have gone relatively smoothly" according to one of the people responsible for the change. Richard Evans says this is probably the biggest change to household waste collections in more than half a century. In reply to complaints of noise from glass collections, Mr Evans says a greater amount of glass was collected than was expected. He apologises and says future collections should be quieter. Jersey's first Children's Minister, Senator Sam Mezec says progress is being made on improving care for vulnerable children but says he is aware there is a lot more to be done. Senator Mezec was responding to a report by Ofsted that found vulnerable children "were not a priority" for the States. He said the states are working to try to attract new workers and make important changes to the island's laws. I know there is work going on or about to begin updating the children's law. There is the new children's plan which is going to be considered by the council of ministers in the coming months. The wheels are in motion. Material other than glass being left in glass bins "could be dangerous" for staff at the island's recycling centre according to the recycling manager. About 6,000 tonnes of glass is processed at La Collette recycling centre and used as building materials. Officials have warned the scheme is becoming unsustainable because of the amount of other waste being mixed in with the loads. They say glass bins could be returned if they contain to many non-glass items. Emma Richardson-Calladine, says there is an increase in plastic labels being included and a lot of plastic bags. She said: ""We can try and clean it but there a number of pollutants in there including hazardous things such as light bulbs and electrical which are causing us troubles on site." A company which specialises in designing skate parks has been chosen to design plans for a new park here in Jersey. People from the Danish company, Glifberg-Lykke are visiting Jersey next week to look at potential sites and talk to people who will use the site about what they want. Once the company has drafted designs for the new skatepark supporters will start to raise money to pay for it. Parliamentary representatives from across the British Isles are in Jersey for a conference this week. They are sharing ideas on best practice, as well as discussing how parliaments will be dealing with Brexit. Greffier of the States, Dr. Mark Egan, who is leading this year’s conference in Jersey, says, “This is a fantastic networking opportunity for parliamentary colleagues from around the British Isles to come together to learn and share best practice." Pupils in Jersey are being encouraged to sign up for a new charity dodgeball tournament to raise money for the British Heart Foundation. It is open to all year seven secondary school pupils in the island and schools can enter as many teams as they like. Teams have to have between six and 10 people in them. It is free to enter but teams are encouraged to raise about £50 for the British Heart Foundation. Fundraising Manager, Amy O'Brien said: "The last two years have been a roaring success and all players have really enjoyed taking part. It’s a fun and friendly afternoon and a great opportunity to get children out of the classroom and working together as part of a team." The tournament is at Springfield Stadium on 21 November. Members of the Red Arrows are due to be presented with Bailiff’s Silver Medals at Government House next week in honour of their commitment to the Island. An auction is to be held next week featuring an invalid carriage previously owned by the Dame of Sark and a collection of sculptures and other Channel Island-related items. Freezing or reducing alcohol duties would help ease the staffing crisis in Jersey’s hospitality sector by allowing bars to pay higher and more attractive wages, a leading industry figure has said. A second Jersey social housing company has agreed to "temporarily freeze its rents" while it waits for the outcome of a review into social housing provision. The Jersey Homes Trust manages nearly 800 homes and has joined government owned provider Andium Homes in delaying its proposed rent rise for six months. Under the social housing guidelines rent would have increased by more than 5% in October. A spokesman for the Jersey Homes Trust said the retail price index was up 4.5% this year but average earnings only increased by 3.5%. The guidelines allow for rent to go up 0.75% over the retail price index and because RPI was higher than usual it would have made the increase "very difficult" for many social housing tenants. The retail price index increase in the UK was 2.3% and in Guernsey it was 2.6%. Jersey's Council of Ministers has launched an eight part pledge that requires people to put children first. It is in response to a report by the Ofsted that found vulnerable children in Jersey "were not a priority" for the government. The pledge commits members of the States Assembly, the Council of Ministers and the executive leadership of the island's public services to rapid and concrete action. It says: "We will create an environment where all our children and young people in Jersey are safe and can flourish." The amount of rainfall in Guernsey was 47% lower than the monthly August average, figures have revealed. The average for August over the past decade was 60.5mm (2.4in) of rainfall. But in 2018 it was 32.2mm (1.3in) of rain. Guernsey Water says the island's reserves are at 82.3% of total capacity. Jersey's outgoing Catholic Dean has been recognised by the Bailiff, Sir William Baillhache, for his service to the island. Monsignor Nicholas France has been awarded the Bailiff's silver medal, which honours his service and commitment to the Catholic community. He'll celebrate his final Mass in Jersey at Fort Regent on Sunday.